This program will do nothing but spread bigotry and hate amongst families and put information that is knowingly false into people’s minds. I have heard about your plan to air Leah Remini’s anti-Scientology diatribe on ABC 20/20. As a Scientologist who grew up in a Scientology family, I assure you that this program is pure bigotry and that the idea that the Church of Scientology trains children in sexually explicit content and that their parents are brainwashed into giving their consent is completely false. Growing up in a Scientology family, I was never exposed to anything sexually explicit or inappropriate at any point in my Scientology training. Rather, the opposite: I grew up with Scientology’s moral code, emphasizing honesty, no drugs, and a clean lifestyle. In a world such as ours, where parents have to worry about their children smoking marijuana and engaging in sexual activities at the age of 12, my parents took pride in raising me and my brothers under Scientology’s moral code. 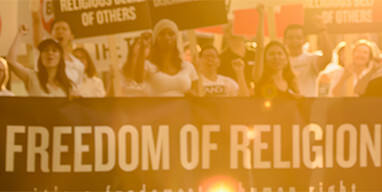 Scientology has helped me in my life to be a better student, make better friends, and be an ethical member of society. At no point in my Scientology training did the Church hide anything from me, and it made sure that my family was fully informed of everything that went on every step of the way.